This piece as shown pictured comprises of two separate mini hair combs which have been styled into the hair together to dramatic visual effect. If you are looking for something different to set you apart from the wedding crowd – this is the piece for you! 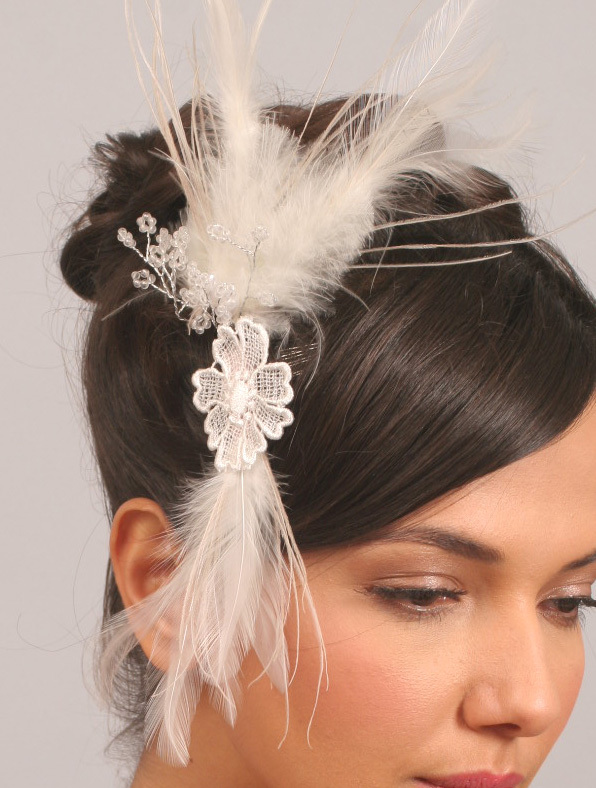 The first small, metal comb comprises of a pretty white floral lace applique piece with a horizontal offshoot of white feathers with accents of champagne ostrich feather strands. It measures 13.5 cm across by 5 cm height, the lace flower measures 5×4 cm. The comb measures 3 cm by 3.8 cm. Please note that the price for Noemie (£79) is inclusive of both combs. If you wish to purchase either of the small combs separately, the price would be £39. Please contact me via the ‘contact seller’ tool if you are interested in this and for photos of the hair combs separately.